On January 14, Chief Minister Mehbooba Mufti had no official engagement related to the ongoing budget session in the assembly. At her official residence in winter capital Jammu over the weekend, her personal staff had scheduled several meetings. In the afternoon, a girl clad in elegantly embroidered green woolen pheran, arrived to chat with the chief minister for some time. The official photographer took several pictures as the two ladies, separated by a generation, discussed films and careers. The plump girl at the chief minister’s house was Zaira Wasim, the teen actor who played the early life part of wrestler Geeta Phogat in Amir Khan’s blockbuster Dangal. Two weeks ago, the critically acclaimed film was released to hit the new records of earning in India and abroad. Zaira is a Kashmiri girl from Srinagar’s Hawal locality that gives a context to her being ‘invited’ to chief minister’s residence. There are hundreds of teen artists who perform in films but they are not invited to meet the chief minister. Even in Dangal, another teen artist is daughter of a Kashmiri woman living in Mumbai. Unlike Wasim, she was not called by the Maharashtra chief minister to offer plaudits. Zaira began shooting for Dangal in 2015. Back then some people attempted to create a controversy when she trimmed her hair to fit the character. Zaira returned to her studies and came out with flying colours in her matriculation examination, just a few days before her eventful meeting with the Chief Minister. The things were going normal for her. 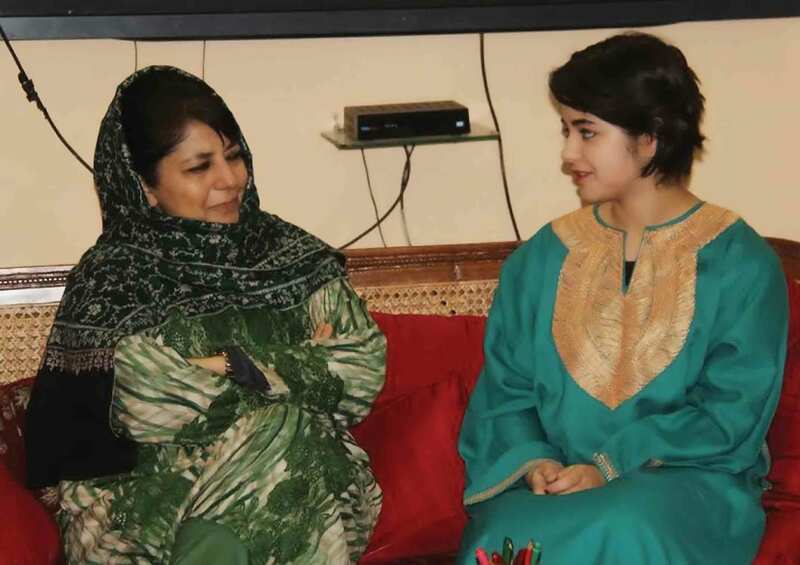 However, no sooner did government release a picture of Zaira-Mehbooba meeting, the click went viral on the social media. The websites and TV channels flashed it and newspapers printed it on their electronic and printed versions. On expected lines, the picture received both accolades and brickbats. Many people took umbrage to Zaira’s meeting with the chief minister in the backdrop of the recent happenings in Kashmir when nearly 90 persons were killed by the police and security forces to quell a public uprising triggered by the killing of Hizb ul Mujahideen leader Burhan Muzaffar Wani on July 8, 2016 in south Kashmir. Many trolls reached to the teen actor’s facebook account to abuse her for acting in an Indian film and meeting Mehbooba Mufti who they describe as primarily responsible for killing Kashmiri teens or blinding them with pellets. Hell broke when Zaira took to social media and tendered apology to “many people who have been offended and displeased by my recent actions or by the people I have recently met.” Referring to “what had happened over the past six months”, she said: “I’m sorry for what I did but it was not a deliberate decision and I really hope people can forgive me.” Later, she deleted these lines. The Zaira controversy faded as quickly as it emerged and escalated. However, it brought the critical issue related to the identity of Kashmiris, more specifically the Muslims, back to focus. A news anchor lives in present without bothering for the perspective or the fallout of a crucial happening in Kashmir. The Kashmiris, on the contrary, live perpetually in one of the highest militarized zones in the world with political resolution far from sight. This impacts every individual, especially those who choose to create a niche in the public life. Zaira is one of them. This identity conflict reflects when Shah Faesal, the only IAS topper from J&K, feels frustrated when the news channels compare him with Burhan Wani. He is compelled to write an explanation as Zaira did, to denounce his detractors and identify himself with the people who are showered with pellets and bullets. In fact Mehbooba Mufti is herself facing the same conflict. By meeting Zaira, she attempts to convey that she is fond of youngsters and wants them to excel in diverse fields. She wants to build a new image where Zaira and Tajamul Islam, the kickboxing champion from Bandipora are visible. She wants to erase certain images that front-paged since 2014. Mehbooba wants to overhaul the frames where girls wearing sunglasses are seen. Of Insha Manzoor who lost her vision to pellets. But images, once created, are rarely lost, especially in the era of new media.